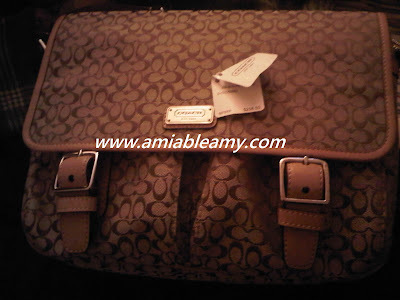 As I mentioned in my other blog, I accompanied the friend of my brother to buy a coach product for his wife. His budget for a single product should not exceed $500. 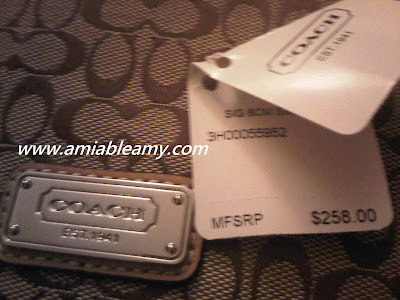 We went to Outlet Mall at International Drive and look for the Coach Store. He was so lucky because the store was giving away a 30% on all items. We were blown away because there were items which has a discount of 50% plus the 30%. Therefore, we will only pay the 20% of the item plus the tax. Anyway, he bought 4 signature coach bags for less than $500. He was so amazed with the price. As for me, I was looking for a sling bag that I can hold both my iPad2 and Netbook. I was just lucky to have found this item. I will not buy it if the price is $258 but, since it was under the 40% off shelves, I am happy with this amazing deal. Besides, I still have the 30% off so; I only paid $108 for my sling bag. This sling bag has a good size compartments. The design is simple but functional and both iPAD2 and Netbook fits good.